An Italian movie on the life of the legendary journalist, Tiziano Terzani. Two hours into the flight, flipping through a choice of inane movies, I clicked on La Fine � il Mio Inizio. As the titles rolled, I sat up. 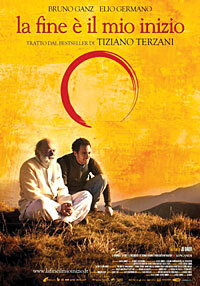 It was an Italian movie in German with English subtitles about the legendary journalist, Tiziano Terzani. I had heard about Terzani in my days as a media nomad in southeast Asia, the dapper hack always dressed in white who had covered Mao's China, the fall of Saigon, the Cambodian holocaust and the People Power Uprising in the Philippines. But this wasn't a movie about a foreign correspondent, but Terzani's conversation with his son, Falco, as he lay dying of cancer in Tuscany. The movie is based on Falco's book of the same name, translated as The End is My Beginning published after Terzani died in 2004 at age 66. Terzani was fascinated with Mao Zedong and how he was trying to transform feudal China through a true peasant revolution. He convinced the German magazine Der Spiegel to hire him as a roving correspondent and travelled to China at a time when the country was difficult to get into for any European, let alone a journalist. Terzani looked at China with journalistic objectivity, and tried not to be judgmental. But, he confesses to his son in the movie: "It took me some time to see the reality." Caught in between the excesses of western materialistic consumerism and Asian communist revolutions gone horribly wrong, Terzani turns to spiritualism even though he himself was an atheist. This quest became his final journey when he found out he had only a few more years to live and sought the solitude of an ashram in the Indian Himalaya. The film follows the last days of Terzani's life as he sits under a tree with Falco gazing out into the serenity of the Tuscan hills. One expects flashbacks to break the monotony of the father-son conversations, but there are none, yet the film is riveting. Father tells son about what he has learnt about life and death, how they are part of a cycle of creation, how in the ashram he discovered the "great one-ness not just of human beings, but also of the universe". Terzani says that once he saw his own life as a part of a greater universal whole, he did not fear death anymore. "You are one with the world, and everything is a part of you," he says, "I stopped looking for a cure for my cancer, and for the mortality that affects us all." Falco takes his father for a walk to a mountain top, and both gaze out into a vast quilt of clouds below. Terzani wonders aloud: "Who or what holds all this together?" After he passes away quietly in the little gompa he built in his garden, Falco takes his father's ashes to the same mountain top. The final scene is an exquisite long shot of the son in silhouette, unfurling the scarf to let the wind carry his father's ashes away. On the plane, three weeks ago, the screen flicks back to the map showing our flight's progress. Because of the Icelandic volcano, the jet was taking a southerly route over Italy. Below us, I could make out the hilltop towns and forests of Tuscany. Joy--deeper still than the grief could be.